Slabjack Foundation is now a Parker Store Product Center. Feel free to visit us the next time you need a hydraulic hose or fittings. Homeowners, Architects, and Engineers can see actual mock ups of elevated homes, helical piles, and Moment Frames. Contractors can see and learn firsthand what is being specified on your job. Slabjack has in stock the largest inventory of Magnum Helical Piles and Helical Anchors on the East Coast, Mid Atlantic, NJ, PA, NY, CT, and DE. We also provide design and support services for helical piles. Slabjack can supply a custom designed Moment Frame for your elevated home. Giving you the peace of mind that your home is safe from the next hurricane or flood. Magnum is an educational provider for both the AIA and PSE for continuing education credits. We also train and certify installers to insure you of the best installation possible. Slabjack Foundation LLC opened a new design center in April of 2013 to help homeowners and businesses rebuild after Super Storm Sandy. Located in Point Pleasant N.J. Slabjack is a Distributor of Magnum Helical Piles, Magnum Moment Frames, and Magnum Push Piers. In addition Slabjack sells installation equipment such as torque motors, torque monitoring devices and certified gauges. 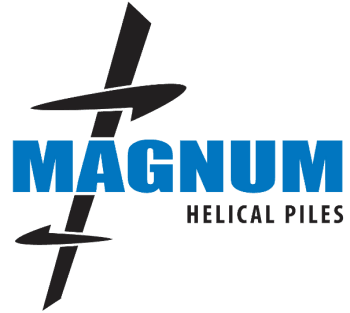 Magnum Helical Piles have been proven to be the best designed pile for the east coast. Helical piles are available in many sizes making their application for beach or bay a perfect fit. Slabjack proudly carries Magnum helical piles and has them in stock for pickup today! Delivery options are available as well. We are industry leaders when it comes to helical piles, providing high quality products that are ready to install. Whether it be for a house, commercial building, light pole, pedestrian bridge, sound wall, or any other structure in need of a strong foundation, contact us today to ensure you receive the highest quality helical piles in the industry. Learn more about our helical piles. Learn more about our push piers. Learn more about our Magnum Moment Frame. Learn more about our pile installation equipment and anchor drives.